Outrage after fans of Arab Bnei Sakhnin soccer team disrupt moment of silence for drowning victims. Fans of the Arab-Israeli Bnei Sakhnin soccer team caused outrage after they booed during a moment of silence held for the ten students who drowned in last week's flood. Before Saturday's match against Hapoel Ra'anan at Sakhnin's Doha Stadium, Israel's Football Association ordered a moment of silence to be held for the victims. 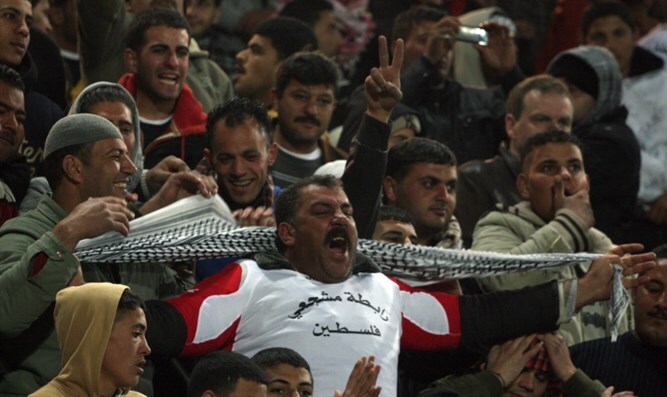 However, the Sakhnin fans booed and cheered, sparking outrage from politicians and public figures. "This is shameful behavior that seriously harms the feelings of families and coexistence between Jews and Arabs in Israel," tweeted Druze MK Ayoub Kara (Likud). "The sport must remain outside the boundaries of politics and the Football Association must intervene so that the soccer fields will become a focal point for bringing together hearts and stopping hatred," he added. Right-wing attorney and activist Itamar Ben Gvir wrote a letter to the Israel Football Association demanding that Doha Stadium be shuttered in response. "There seems to be no need to elaborate on the seriousness of the matter and the severe harm to families who lost their loved ones. There is also no need to mention that if we were talking about Beitar Jerusalem fans who are mourning a ceremony in memory of young Arabs who perished in a disaster, you would close Teddy Stadium for a long time," continued Ben Gvir, referring to the Jerusalem soccer team which has been repeatedly penalized for racist anti-Arab chants by its fans. "The time has come for the Football Association to stop discriminating between Jews and Arabs." Saturday's incident is not the first time that Bnei Sakhnin fans have caused controversy. In 2014, then-Foreign Minister Avigdor Liberman called for the club to be shuttered after it held a ceremony honoring former MK Azmi Bishara, who fled Israel after he was found to be spying for the Hezbollah terror group during the Second Lebanon War.